Reliable protection against viruses, Trojans, rootkits, and spyware with TeamViewer Endpoint Protection. Keep your computers clean and safe. TeamViewer Endpoint Protection protects your computers against threats such as viruses, Trojans, rootkits, and spyware. 24/7 – no matter if on- or offline. Determine time, scope and thoroughness of each scan-policy and apply them to different computers or groups. Effortless deployment – Security in no time. Do not worry about bothersome installation processes. All it takes is just a few clicks to activate TeamViewer Endpoint Protection on your computers. Install and forget! No maintenance required on your part. Multiple times a day TeamViewer Endpoint Protection updates itself by downloading the newest definitions to keep your computers immune – also to the most recent threats. Protection round the clock – With real-time protection every file that is accessed is scanned instantly for potential threats. Your devices are protected the second you activate TeamViewer Endpoint Protection on them. Tackle the Shadow IT – Hooking up private devices to a USB port, such as smartphones and USB sticks, is common practice. Any existing malware on those devices finds its way directly into the network, bypassing firewalls entirely. TeamViewer Endpoint Protection automatically scans devices plugged into a USB port for potential malicious software, preventing any nasty surprises. 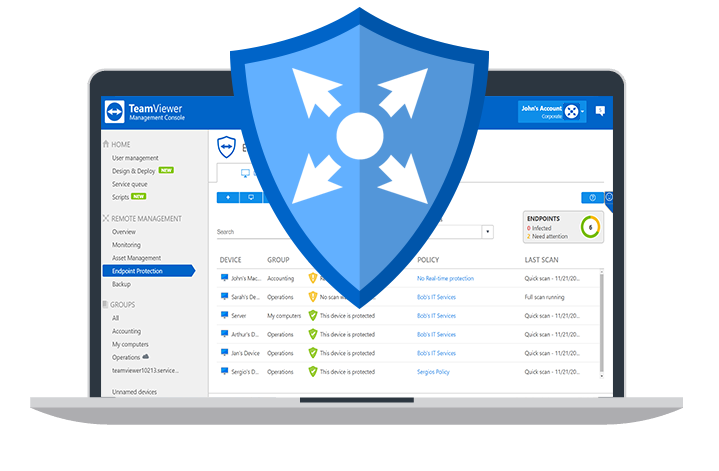 The best fit for your company: With TeamViewer Endpoint Protection you are able to set individual policies to adjust TeamViewer Endpoint Protection to your company’s needs or even to specific computers within your network. Tell TeamViewer Endpoint-Protection when to perform a scan. Schedule your scans daily, weekly or in individual intervals. Choose if you want to perform a full scan to ensure maximum safety or a quick scan during working hours. Keep an eye on suspicious or risky paths. TeamViewer Endpoint Protection allows you to specify whether you want to scan a whole disk, a certain path or just a particular file. Don’t miss anything. Should TeamViewer Endpoint Protection detect a threat on one of your computers, the file will be put in quarantine immediately. You will receive alerts within TeamViewer or the TeamViewer Management Console informing you about the action. Even on the go you will never lose control. Set up email notifications for any of your scans. Determine the recipients of these emails individually and ensure that the right alert gets to the right person at the right time. TeamViewer Endpoint Protection (formerly known as ITbrain Anti-Malware) has been awarded the VB100 certification for reliability by the magazine “Virus Bulletin”. This award certifies a detection rate of 100% of malicious software listed as ‘In the Wild’ by the “WildList Organization”. In addition, anti-malware software awarded this certification must not generate any false positives.